Last week at the SIAR 2017, we were able to peruse one of the latest creations from Christophe Claret. The Adagio Minute Repeater Unique Piece in 18K yellow gold not only features a minute repeater but also a dual time function with day/night indicator, date function and running seconds indicator. With a case fully engraved by hand and a cathedral gong, this is for sure one of the most exquisite timepieces that a seasoned watch collector could aspire to own. Posted on October 25, 2017 by Editor & Publisher and filed under Christophe Claret, Other Brands and tagged Christophe Claret Adagio Minute Repeater Unique Piece. SIHH 2017: Christophe Claret Maestro. Hands-on Live Pictures & Pricing. Following a clear and consistent product design strategy, Christophe Claret unveiled the new Maestro at the SIHH 2017. With a name that takes its inspiration by the excellence of the master watchmaker, Christophe Claret himself, this watch with a perfectly domed crystal provides a striking, almost dizzying view of the movement architecture and the famous Charles X bridges. Equipped with a manual wound 7-day power reserve movement, a cone-shaped large date display and a 3D reminder function —MEMO function as Christophe Claret calls it—, the new Maestro is the first Haute Complication watch by Christophe Claret at a more affordable price when considering what haute horlogerie timepieces are going for these days. Posted on January 23, 2017 by Editor & Publisher and filed under Christophe Claret, SIHH 2017, SIHH, Other Brands and tagged Christophe Claret Maestro Independents Christophe Claret Most Popular. News: Pre-SIHH 2017 New Christophe Claret Maestro. The New Entry Level Timepiece for this Brand. Its name is inspired by the excellence of the master watchmaker. Its sleek style epitomizes mechanical power. At the crossroads between aesthetics and technicality, the new Maestro showcases an original take on the horological creativity of Christophe Claret. Its glass dome provides a striking, almost dizzying view of the movement architecture and the famous Charles X bridges. Posted on January 10, 2017 by Editor & Publisher and filed under Christophe Claret, Other Brands, News, SIHH, SIHH 2017 and tagged Christophe Claret Christophe Claret Maestro SIHH SIHH 2017 Most Popular. Insider: Christophe Claret Mecca. Hands-on with the Timepiece with a Mirascope and the Kaaba at the Center of the Dial. Regardless of the different religions our readers follow or don't follow, the Christophe Claret Mecca is a timepiece that deserves to be featured here at WCL as it is one of the most fascinating timepieces out there. Religious orientation aside and just like they did with the Christophe Claret Aventicum we reviewed here, the Christophe Claret Mecca follows the same design principle and execution, but this time the mirascope highlights the micro-engraving of the Kaaba, the cube-shaped mosque at the center of Islam's most sacred site — Al-Masjid al-Haram— in the Holy City of Mecca in Saudi Arabia. Posted on December 1, 2016 by Editor & Publisher and filed under Christophe Claret, Other Brands and tagged Christophe Claret Mecca Christophe Claret Most Popular. A master watchmaker with 25 years of experience, Christophe Claret has combined the finest horological complications in the three new models of the acclaimed Soprano presented at the SIHH 2016 Salon International de la Haute Horlogerie Genève. The Soprano is now also available in Chocolate, Blue and Black. Insider: Christophe Claret Aventicum. The Watch with a Mirascope and a Three Millimeter Marcus Aurelius Bust. The Christophe Claret Aventicum is inspired by a gold bust of Roman emperor Marcus Aurelius unearthed in 1939 at Avenches, Switzerland. At the heart of this timepiece, Christophe Claret has placed a small scale reproduction of this bust in gold measuring only 3 mm high and micro-engraved to resemble as much as possible —considering the scale— the original bust from where it takes its inspiration. Posted on January 13, 2016 by Editor & Publisher and filed under Other Brands, Christophe Claret and tagged Christophe Claret Aventicum Christophe Claret Most Popular. Insider: Christophe Claret X-TREM-1 White Gold. Hours and Minutes Displayed by a Magnetic System. Christophe Claret's X-TREM-1, is one of those watches where your mind needs to wrap around the idea that a magnetic field is the one working behind the scenes to display the hours and minutes. While horological fans understand that magnets and mechanical timepieces don't go well together, Christophe Claret decided to do the impossible by mixing them in one amazing horological complication. The X-TREM-1 ref. MTR.FLY11.100-108 features an 18K white gold and grade 5 titanium case with white gold metalized numerals and a tourbillon case at 6 o'clock. This timepiece is as visually striking as it is technically innovative. Christophe Claret has always focused on developing original timepieces incorporating the latest technological innovations. The brand is known for pushing the boundaries of mechanical watchmaking and straying away from the beaten horological path. First presented in 2012, X-TREM-1 is a testament to this endeavor and represents a totally new way of telling the time. Posted on August 10, 2015 by Editor & Publisher and filed under Christophe Claret, Other Brands and tagged Christophe Claret X-TREM-1 White Gold X-TREM-1 ref. MTR.FLY11.100-108 Top Brands. Baselworld 2015: Introducing the Christophe Claret Allegro. Live Pictures and Pricing. Following Adagio and Soprano, Christophe Claret presents his latest musical masterpiece, Allegro. A master watchmaker with 25 years of experience, Christophe Claret has combined the finest horological complications in Allegro: a minute repeater with cathedral gongs, GMT, big date, small seconds and a day/night indicator. These features are all found in a completely redesigned movement featuring a unique regulator that was designed and manufactured in-house. The 45 mm round case harmoniously blends either 5N red gold or 5N white gold with grade 5 titanium treated with anthracite PVD. An opening in the sapphire dial reveals the striking mechanism. The transparent dial allows the wearer to marvel at the movement’s architecture, featuring Charles X style skeletonized, stepped bridges. With this new timepiece, the conductor of this musical horological orchestra from Le Locle proves he is at the zenith of his art. Posted on March 30, 2015 by Editor & Publisher and filed under Christophe Claret, Baselworld, News, Other Brands and tagged Christophe Claret Allegro Baselworld Baselworld 2015 Top Baselworld. News: Presenting the New Christophe Claret X-TREM-1 Chocolate. Hours and Minutes Displayed by a Magnetic System. Christophe Claret is pleased to present X-TREM-1 Chocolate, featuring a red gold and grade 5 titanium case treated with chocolate-color PVD, plus an alligator-skin strap of the same brown hue. This timepiece is as visually striking as it is technically innovative. Christophe Claret has always focused on developing original timepieces incorporating the latest technological innovations. The brand is known for pushing the boundaries of mechanical watchmaking and straying away from the beaten horological path. First presented in 2012, X-TREM-1 is a testament to this endeavor and represents a totally new way of telling the time. X-TREM-1 displays hour and minutes by means of two tiny hollowed steel spheres isolated within sapphire tubes on both sides of the caseband. Posted on July 9, 2014 by Editor & Publisher and filed under Christophe Claret, News, Other Brands and tagged Christophe Claret X-TREME-1 Chocolate. 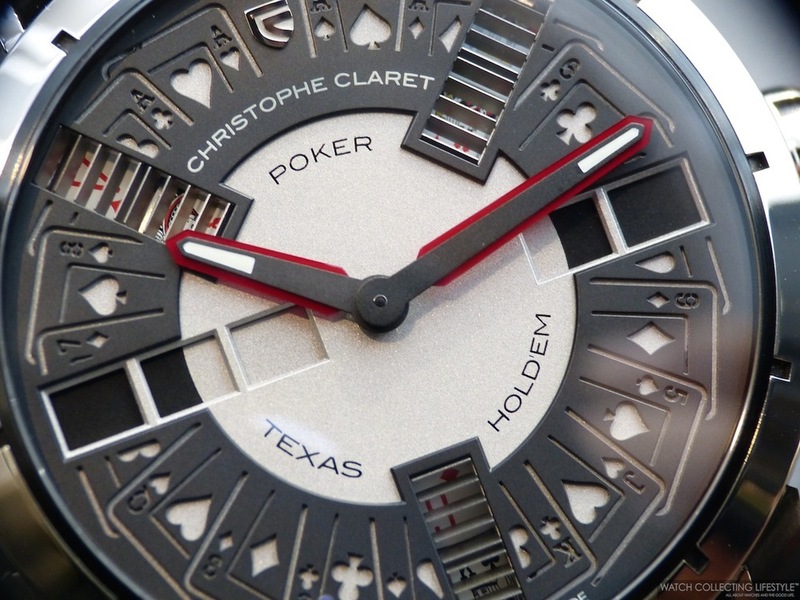 Baselworld 2014: Christophe Claret Poker with Texas Hold'em on the Wrist. Live Pictures and Pricing. After the successful launch of the Christophe Claret 21 Blackjack and the Baccara, now comes Poker, the latest addition to Christophe Claret's trilogy of gaming watches. Christophe Claret's fertile imagination has managed to devise the mechanism for this sophisticated card game and enclose it within a case just 45 mm in diameter. After a quick round of Poker with Mr. Claret, we went ahead and started taking these pictures for you. For up to three players and the house, there are an incredible number of gameplay possibilities. Poker was actually to be the first of the gaming timepieces launched by Manufacture Claret. While the game seems simple to organize on a table, its watchmaking version is an extreme test and no technical solution had been found until Christophe Claret himself came up with the answer. While the first prototype was working in 2011, it required two years to perfect the intricate complication. Devising the gearing and bringing it all together in a mechanical movement —in other words, orchestrating a complete 52-card game following the rules of poker— is a real feat, one which offers Haute Horlogerie exciting new technical prospects. In total, Poker packs in 32,768 different combinations, i.e. 98,304 combinations for three players. variant of poker: Texas Hold’em. As a recap of the rules, a game of Texas Hold’em starts with two closed cards being dealt to each player, i.e. visible only to the player. Five other open cards are dealt out in stages: three, known as the flop, after the first betting round; an additional card, the turn, after another betting round; and finally a last, the river. To have the best hand in Texas Hold’em poker, the player must have the best possible combination of five cards from the seven in their hand. This is how the PCK05 automatic movement came into being. This completely original automatic-winding in-house caliber comprises no fewer than 655 components, and features two mainspring barrels that provide approximately 72 hours of power. There are bound to be some late nights! But no need to worry, as well as its gaming functions, Poker has not abandoned its time display role, with two central hands providing excellent legibility. Poker is the very first timepiece that manages to replicate the game in an automaton watch. The ease of use when playing Poker is as impressive and unexpected as its intrinsic complexity. Up to three players face each other around the watch. The first hand is dealt by means of a pusher at 9 o'clock. This winds up a spring, which simultaneously spins four concentric discs —one of which made from sapphire— on which the cards are printed. There is no way of speculating as to the position of the discs. After a few moments the discs are immobilized at random by dampers. All the discs are mounted on ceramic or ruby bearings so they turn as freely as possible. Once the push-piece at 9 o'clock has been pressed, the now shuffled cards are dealt in windows at 6 o'clock, 10:30 and 2:30. An ingenious mechanism of angled shutters makes them invisible to the other players. After this first betting round, the pusher at 10 o'clock reveals the flop, i.e. three cards which appear on the left of the dial. Another push-piece at 8 o'clock then reveals the turn, one card on the right of the dial. Finally, the same push-piece deals out the river, also on the right of the dial. 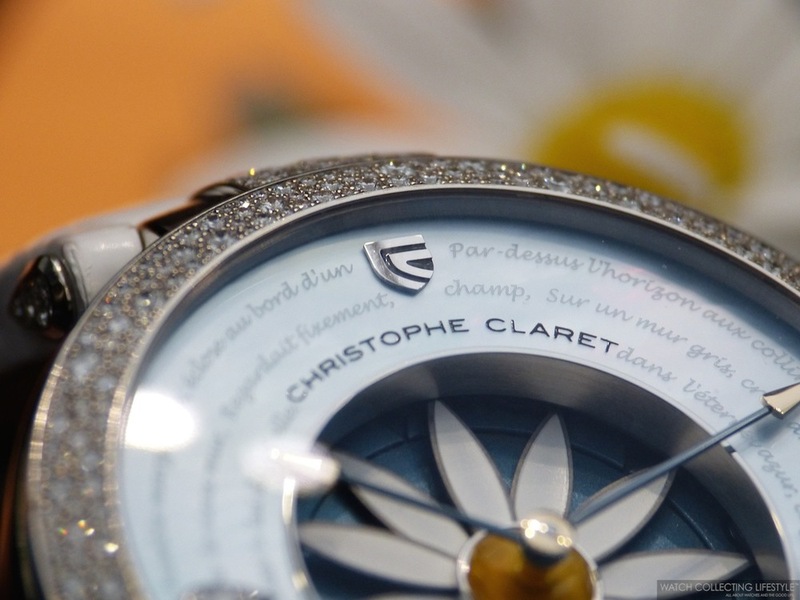 True to his mastery of chiming watches, Christophe Claret equipped Poker with a cathedral gong, which sounds whenever the flop and turn/river pushers are pressed. among the most expensive to make because of the complexity of machining these precious materials— are enhanced by a luminescent coating. The hour indexes are on the bezel so as not to crowd the stage. Although the dial has an incredible 77 components, its balanced harmonious design ensures that the players are not distracted. And, in a final detail that aficionados may appreciate, a breath of air forming condensation on the watch sapphire crystal reveals a pin-up girl… Welcome to the world of the casino! This world of the casino even continues through to the back of the watch. The transparent case-back provides a view of the oscillating winding rotor in the form of a roulette wheel. This rotor design is already an icon of the Christophe Claret Interactive Gaming Complication collection. Once activated by one or two shaking motions, the oscillating weight turns for a few moments before stopping: no more bets please! An arrow points to one of the 37 numbers on an inner ring. Did your number come up by chance? If so, it may have been thanks to a special key opposite a green emerald set on the case back. This personalization is much appreciated by those who believe in their lucky number. Poker is available in four different references: two-tone, black PVD-treated grade 5 titanium and white gold; two-tone, black PVD-treated grade 5 titanium and red gold; monochrome, black PVD-treated grade 5 titanium, with blue spinel hands; and monochrome, black PVD-treated grade 5 titanium with red ruby hands. Poker is covered by a worldwide patent. Each case material is limited to just 20 pieces. Poker is an exceptional timepiece, which, like winning a big game, is only for the lucky few. The video at the bottom of this post will give you a better idea about the way this watch works. Sticker Price $180,000-$194,000 USD. For more info on Christophe Claret click here. Posted on March 30, 2014 by Editor & Publisher and filed under Baselworld, Christophe Claret and tagged Christophe Claret Poker Texas Hold'em.